Did you know that beauty along with money and love are the top searches on the internet? Why? Because everyone ages, it's a fact of life, and people will spend money on the right beauty products to maintain their youthfulness. The anti-aging skin care beauty market is a $2+ billion dollars industry! Even more impressive is the huge growth with natural/organic beauty products. Beauty products are highly consumable because women, men, kids use these products on a daily basis. If you love natural health and beauty products and want to own a piece of this natural market share ... you can with an exciting ground floor home based business with Verefina. 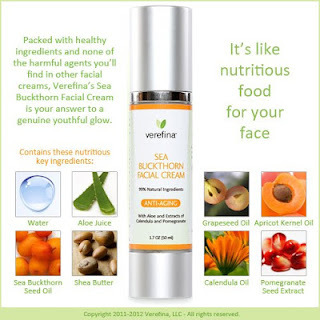 Verefina offers pure and natural skin care, personal care, and wellness products for the entire family. When you start a natural business with Verefina, you'll have everything you need for only $99, along with my proven success training program. Do you know what's in your skin care / personal care products? Unlike other businesses such as jewelry, handbags, shoes, jeans, home decor ... these are products people don't need to use on a daily basis. This means you'll constantly need to hustle and find new customers. And let's be honest- most people unless they're consultants are not going to buy these products from you on a monthly basis, not often enough. There's only so much wall space for home decor. So much room for jewelry, handbags, jeans. That's not to say people don't buy these products but they don't need to replenish every month. Compared to skin care and highly consumable products, people need to re-order on a monthly basis. As a business, this is smart because you have multiple opportunities to earn repeat business. Once you have a raving new customer you're more likely to see repeat business from the same customer over and over. Why start your own natural business and work from home? *You can be your own boss - create your own economy. *A flexible business that can easily fit into your lifestyle. *You can work while you're traveling, on the go with your kids or family, and with a mobile device or laptop you can truly work from anywhere. *Natural products are easily shared simply from mailing out samples to anyone from anywhere. *You don't need to load and unload products and do home parties, trunk shows, make up parties, spa pampering parties, unless it's something you want to do. *Owning a natural business from home is truly flexible - allowing you to build it entirely online and other channels. Whether you're working full-time or just retiring from work to be home with your kids, Verefina offers a truly flexible business to help you be successful. Join the movement and achieve natural health and wealth! *Full training and unbelievable support. *Quick start to success with my proven success training system. *Grow quickly or slowly as you'd like - it's 100% up to you. *Help educate others on the health benefits from using pure and natural products. You're 5 minutes away from owning your dream business - it's that easy! P.S. Need more info? Let's chat! 805-712-0840. And, Do you want to help people by starting herbal medicine business?